Check Out my Broken Gear!! The Effect of Guild Bank Repairs! So you see, not having too much time to play… you naturally don’t even have time to make money. So I’ve been running from 12k gold to now 4k gold, giving a few thousands to Takalo, my “instructor” LOL (yes, I have a variety of friend who plays on same server). So well.. where do I get free money? GUILD REPAIRS! 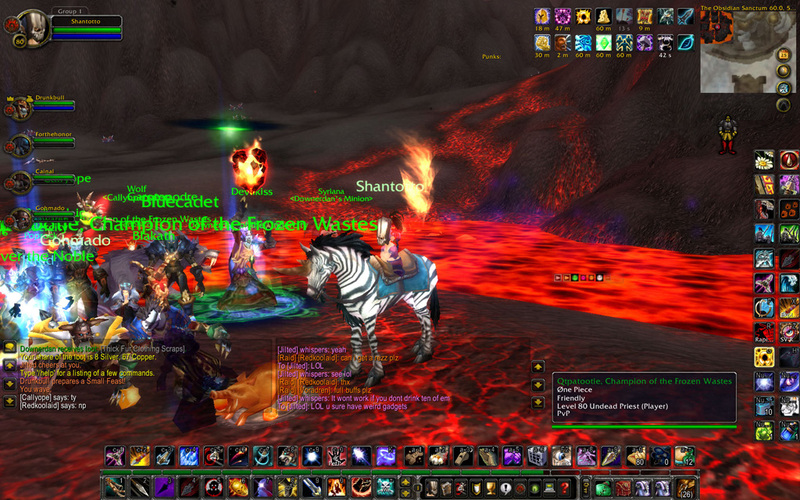 Okay you see, on the right I’m doing OS25 with PUGS, I think I’ll still beat a lot of meters with broken gear. This was on Monday! 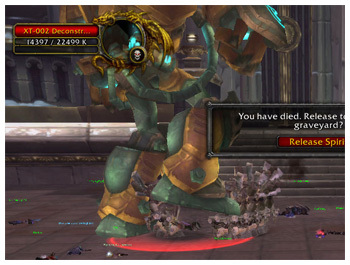 Repair bills in WoW is kinda like errr… exp penalty in FFXI. Both games, you either need to spend time re-leveling or earning the gold to pay for the loss of your e-life. They are roughly the same… but see there’s a new feature, “Guild Repair”, meaning your guild will pay for your repairs :D and our guild leader turns on that feature during Raid.. naturally :) You want to take advantage of it! Remember the JP Button Question? 3. Why does it seem like many foreign players (NA Players) do not bother to bring medicines and potions to Missions and BCs? Many Japanese players make sure to have Vile Elixirs, Hi-Potions and/or Reraise Earrings. 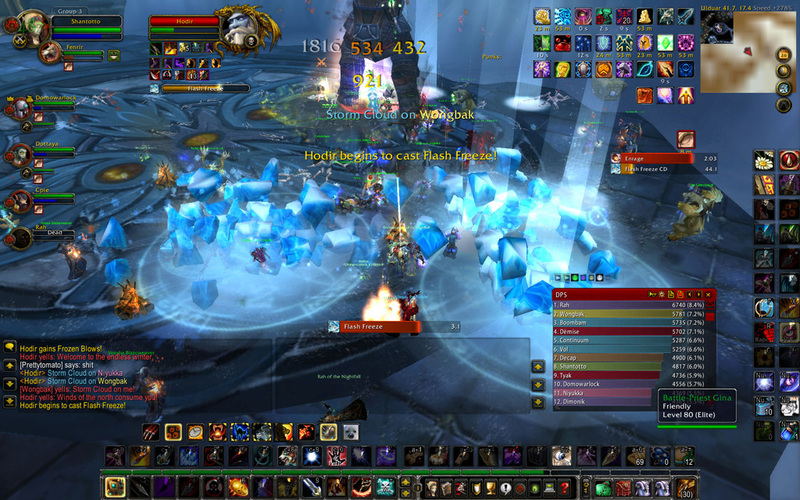 So Tuesday came around, its time for our weekly Ulduar 25man Raid. 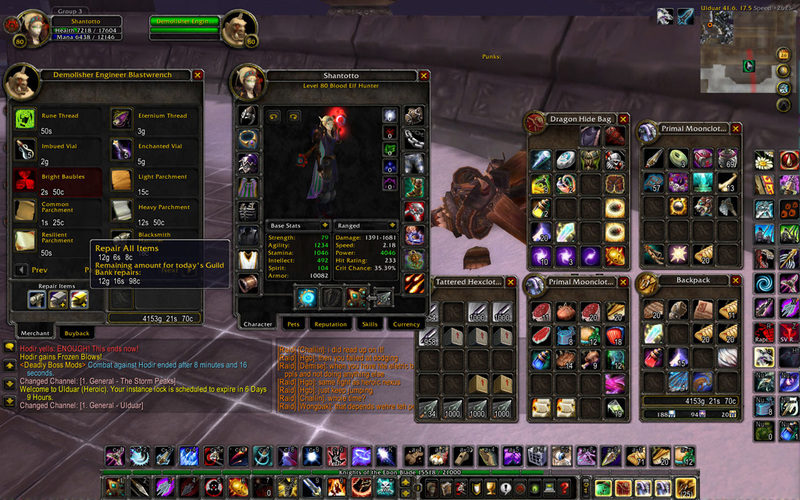 So knowing Guild Repair is going to open “after 1st wipe”, I just went in with pretty broken gear. Not entirely broken, just the shoes… still good! 1/50 is completely working good gear! 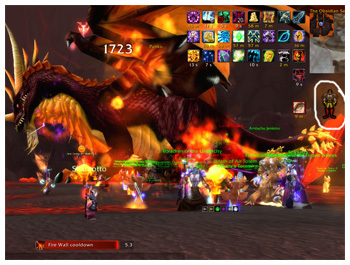 We did Flame Leviathan. It was all good until the driver of the tank shot me at the wrong direction when I wasn’t ready. 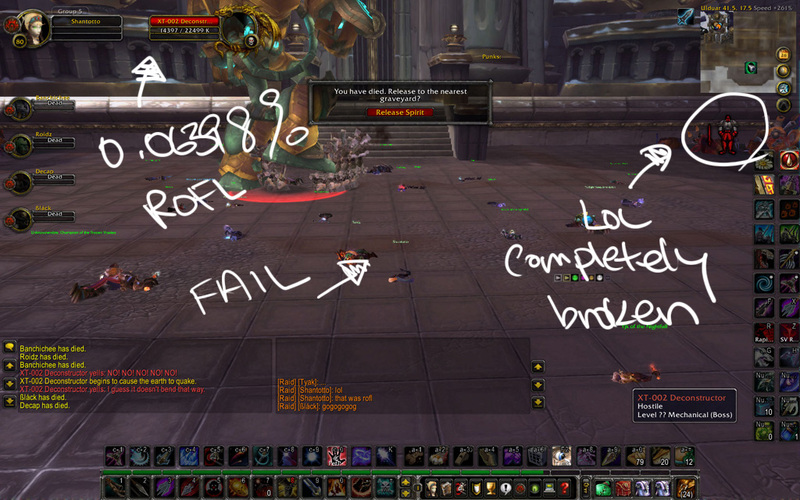 I died, and was probably the only 2-3 people that died…. well since it’s not a full wipe, I just got a Raise and… didn’t had time to repair! Well… that means I was 6 piece broken heading into XT De-constructor! NOT MY FAULT!!! Wiping at 0.06398%! Knowing you could have done something! So the fight began, I realize the damage was so… low :D. My AoE wasn’t even doing 1000 on normal hits XD but was more like The Burning Crusade-type damage XD holy moly XD Well… I thought a little bit ahead, since my damage is going to be low, I swap to marksmanship to cover it up XD (since Marksmanship isn’t known for good DPS, so they won’t really notice broken gear). Hay! You all get Trueshot Aura! If an average repair bill for each person is 8g, then 25ppl is 200g :O I feel kinda horrible knowing I could have done better, simply repairing an item. :o It’s not like I’m broke poor, I’m just stingy. Hay! Stingy isn’t a bad thing :) You save money/gil/whatever! 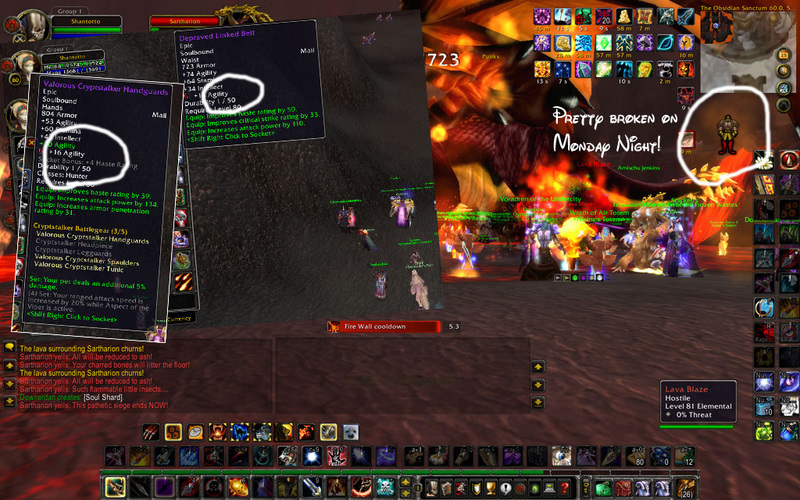 So Gbank opened up after that wipe, I had a daily repair limit of 75g! I make sure I used all that :) I mean lookie! XD. My guild so nice, they even gave me 2 new shineys :D the 3rd best DPS staff [item]45256[/item] and the #1 DPS bow :D [item]45327[/item]. Sitting on a Bench talking about old-school FFXI! 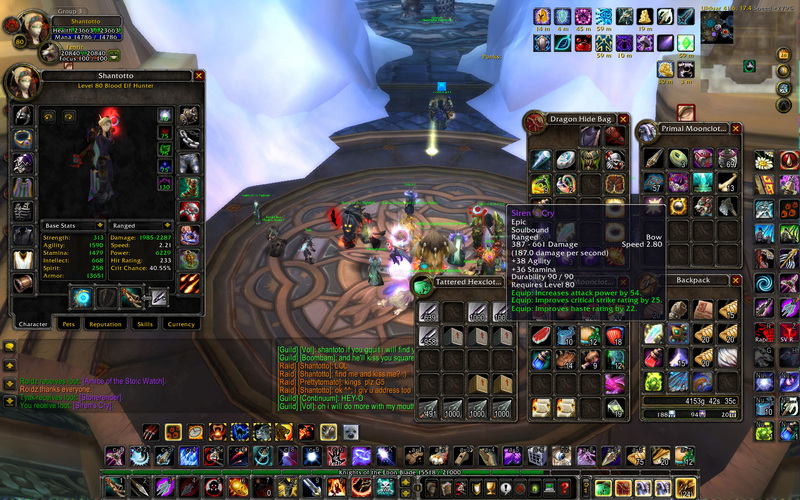 Wow at the JP Button (buddon as I would say)…People not being prepared is a huge problem in WOW too. 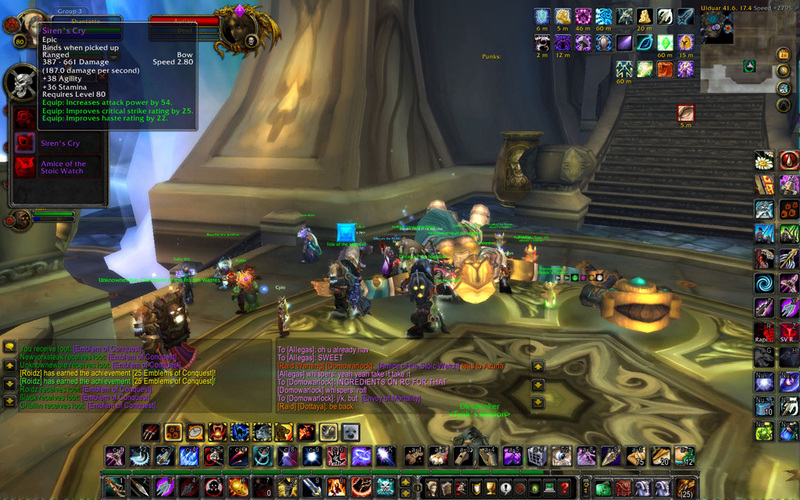 There’s a addon the raid leaders use to see who isn’t Flasked up or Feed Well (I bring Fish Feast to the table, err floor of course). I think the biggest problem with the FFXI Meds (from what I remember), is that they take way too long to use (from what I saw). Other than food, I had maybe one vile exiler one me incase of an emergency. Now I have 20 Runic Mana, 10 Runic Health, 10 Frostwyrm 5 Mojo Flasks and 40 Fish Feast. I think WOW is a little bit more friendly with Meds than FFXI is (I just hate that, 1 use per battle…O well, Thunderstorm is my friend). haha wow you’re still around! and i hav to agree WoW is a little too casual… that sometimes I’m not even as punctual and prepared as I wanted it to be. and I think i can speak for alot of people.